Our mitta volunteers woke up early in the morning to cook the food with love and happiness. 11.30 am, most of the food items from our stall have sold out. There was a large crowd and customers who came back to buy more of the nasi lemak and jelly. A string of customers waited in line for pan cakes. By 12.30am, all items were sold out. In the late evening, many lit candles in rememberance of our friends, and giving hope & support to cancer survivors. Male volunteers camp through the night. It was raining and was a cool wet night. The next morning another shift of volunteers took over. All of us enjoyed the morning exercise, walking on the field, chatting and lauging away. 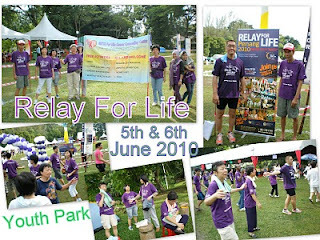 Mdm Yeo Gek Lin was diagnosed with cancer in 2007 and was hospitalized in Penang General Hospital. Her cancer spread to her right leg. She finds difficulty in her movement. Doctor advised to amputate her leg. On 26th April 2007, the operation took place. One year late, in 2008, her cancer again spread to her right arm. There is a prominent lump on her arm. It was solid hard like a golf ball. 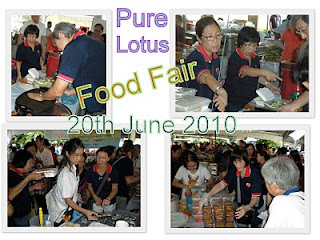 Rev of Pure Lotus, on her frequent visit to General Hospital saw Mdm Yeo. Upon hearing the Dr. wants to amputate Mdm Yeo’s right hand again, Rev approached the Doctor in charge to discharge Mdm Yeo to Pure Lotus Hospital so that Mdm Yeo can be cared there. Although, there is a lump on her right arm, but Mdm Yeo is very positive about her condition. She remained cheerful and likes to talk and joke with people. The minute we walked in to Pure Lotus, her grin and smile is there to welcome Mitta volunteers. 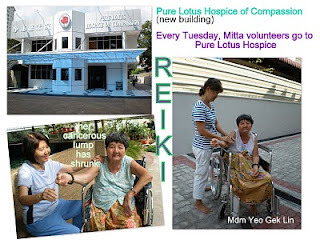 She and other patients of Pure Lotus; is always happy to see us and waited for us every Tuesday. 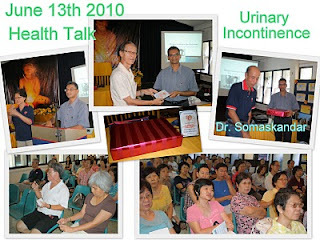 While doing Reiki; the volunteers talked to the residents. Mitta volunteer Mrs. Neoh sings "Hock Kien" songs to cheer up the inmates. Angela as always loved by many, joined in the laughters & jokes without having to use loud speaker; Angela brightens up the place with her ever-smiling face and sharp voice. Volunteers on duty send Loving Kindness and Reiki the residents every Tuesday morning from 10am to 12 noon. 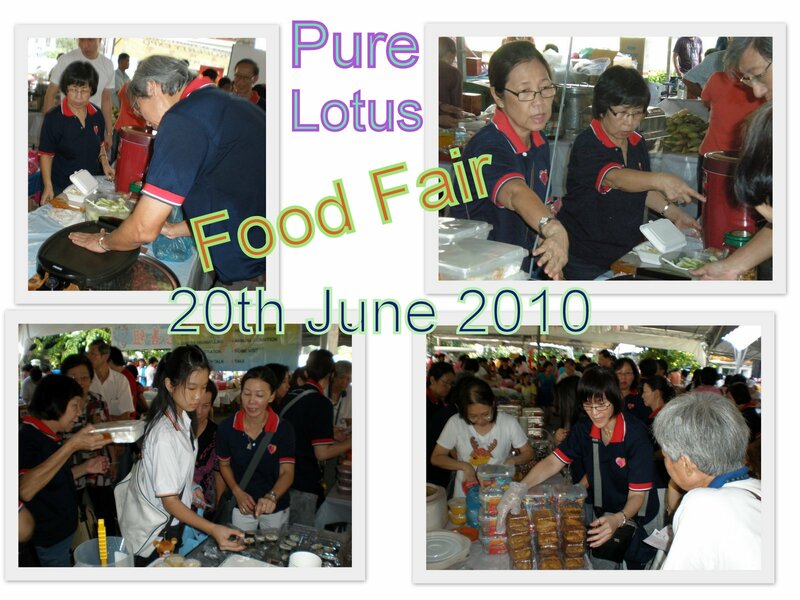 We noticed from their faces that the residents of Pure Lotus Hospice look forward to our weekly Tuesday visit. The love and compassion shown by Mitta volunteers send out a message that Mitta cares for them. Lately, I noticed that the lump on Mdm. Yeo’s hand is much softer and has shrunk in size!!! Reconfirmed this with Mitta volunteers there, YES, they too noticed it. Mitta volunteers, all of you have done a great job. Sadhu…to you.